Delphine: At the beginning we met together with Matti and discussed about how to do our project. But the first day, He could not come, so I am alone….I sit in front of the teenagers, they are distant. They listen, look at my paintings, but do not communicate. I speak about the project….. No reaction. The teacher suggests they participate…Some agree. They do not know how to draw. I suggest they work with the color of the subjects. They begin to play with the médium. At the beginning many darkened colors….. the young people open up…. in the evolution of our civilization. Each person has a place, each his or her own … We have to learn respect. Matti: I could not be present in the first days, so Delphine had to start the project by herself with the students . Thursday afternoon we were in the school together, helped the students to finish their works and had a discussion with the students about the topic and about the whole project. The youngsters were quite quiet but they received very well all that we spoke to them about this work. At the end the teacher told us about the process of each student and she was satisfied. opettaja kertoi miten oppilaat kokivat projektin ja hän oli hyvin tyytyväinen. skolan tillsammans hela eftermiddagen, vi hjälpte lite ungdomarna i sina arbeten och diskuterade slutligen temat och hela projektet. Ungdomar var lite tystlåtna men lyssnade noggrannt var tacksamma när vi berättade om projektet. Under hela veckan var vi i kontakt med varandra och diskuterade regelbundet arbetets framsteg. I slutet av veckan berättade läraren om hur eleverna upplevde projektet och hon var mycket nöjd. Art therapy education in England and Holland. I’m excited for the symposium because in my profession I work daily with people in a therapeutic atmosphere and it will be nice to have a more artistic approach while still maintaining a social aspect. And an international project is always interesting. I’ve been working as an art therapist since 1985. I studied at Tobias school for art in England from 1980-1982. I completed my postgraduate study in The Netherlands at The Hague from 1991-1994. 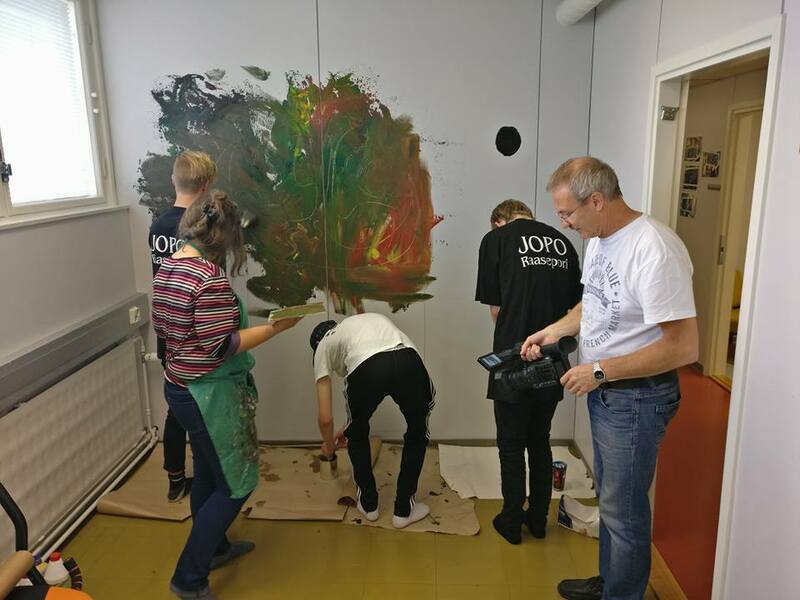 I have worked as an art therapist in many different contexts: In Södertälje, Sweden at a nursing home and prison, in Finland at day care centers and schools, in Jorvi and Paloniemi psychic hospitals and with people with intellectual disabilities. At the present, I have a part-time job with the HUS Joint Undertaking in Lohja. In addition, I work at Sammatti Steiner school and with disabled adults in Karjalohja. I occasionally participate in joint exhibitions, most recently Akvart Galleria in January 2016, and Perspektivet Galleria Syksy in 2015. I’ve painted murals for old-age homes and hospitals, and have designed and implemented decorative painting for private homes, offices, schools, and other public spaces. Olen kolutukseltani taideterapeutti ja olen työskennellyt taideterapeuttina vuodesta 1985 lähtien. Opiskeluni suoritin Englannissa Tobias school for art;issa v.1980-82. Suomessa Päiväkodeissa, kouluissa, Jorvin ja Paloniemen psyk.sairaaloissa ja kehitysvammaisten henkilöiden kanssa. Tällä hetkellä minulla on puoliaikainen virka HUS-kuntayhtymällä Lohjan seudulla. Lisäksi työskentelen Sammatin Steiner koulussa ja kehitysvammaisten aikuisten parissa Karjalohjalla. Taiteellista työskentelyä olen tehnyt koko ajan ja osallistunut harvakseltaan lähinnä yhteisnäyttelyihin, viimeksi Perspektivet Galleria Syksy 2015 ja Akvart Galleria tammikuu 2016. Olen tehnyt seinämaalauksia vanhainkoteihin ja sairaaloihin, sekä suunnitellut ja toteuttanut sisustusmaalausta yksityiskoteihin ,toimistoihin, kouluihin ja muihin yleisiin tiloihin. · A directly inspired research of Romanesque art, medieval literature, and sacred texts. · A research of the feminine body. At the same time goddess mother, rider, protector, or seductress, the body of the woman allows me to explore the sacred. Her round forms generate desire and questioning. ·Examination of stories involving animals, beasts, and fantastic characters and legends. The idea takes shape in the material. And in the captivating darkness from which every enlightened spirit is born, the light grows the gem. The image becomes a code which cracked when it is analyzed, and the inquiring mind can then be guided by its imagination and its sensibility to travel to an internal world. I like thinking that each person can find one moment of unsettled eternity in my paintings . Two apparently conflicting factors which converge into a coherent work that allows me to speak several facets of the sacred. I like to discover other cultures because it gives me the opportunity to discover alternative perspectives. I like to meet other artists and travel to other countries to work in different artistic studios. Participating in this ISEAS project will enable me to form relationships with a lot of new people. During each trip, I meet different mythologies which inspire my works. Raaseporin joustava perusopetus järjestetään kymppiluokan yhteydessä Karjaan keskustassa osoitteessa on Nils Grabbenkatu 5, 3. kerros. Ryhmän koko on max. 10 oppilasta. Lukuvuonna 2017-18 jopolaisia ryhmässä on 4. Opettajana toimii Laura Meretniemi-Peltola. Raasepor’s flexible elementary education is organized so that children who cannot finish in the usual nine years can take another year and finish in ten. It is located in Karis. The size of the group is max. 10 pupils. In the academic year 2017-18, there are 4 in the Jupiter group. The teacher is Laura Meretniemi-Peltola. The JOPO class is intended for students who are at risk of leaving the comprehensive school, or having lots of absenteeism or poor performance on their certificates, leaving them at risk of being excluded from society for one reason or another later in life. Activities in the JOPO program enable them to benefit from functional methods and job training. The goal is to receive a comprehensive school certificate and a diploma from the second level. Students also learn to nurture a positive attitude towards life and study, gain independence and responsibility, develop self-awareness, acquire cooperation and interaction skills, evaluate their own activities, make realistic plans, acquire the information needed for studies, society and life in general, and finaly utilize information and communication technology.